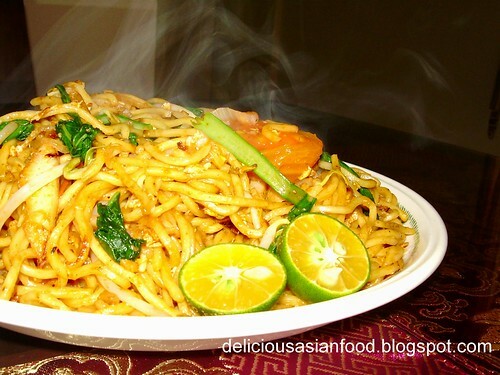 When I go to mamak stalls, I sometimes order mee goreng (fried noodles). Most of the time, the noodles are cooked in slightly dark coloured gravy due to the use of dark soya sauce. As for me, I have not been able to replicate the same type of mee goreng probably because I do not use the same type of ingredients. I do, however, have my own recipe for mee goreng in which I use yellow noodles, tomatoes, fried beancurd, bean sprouts, chinese mustard (sawi), onions, garlic and fried fish cake (see photograph on right for ingredients used). If I have left over fried chicken, I will also put it in for extra flavour. My mee goreng is basically sweet, sour and hot in taste as I use tomato and chilli ketchup. Do try it as it is not difficult at all. Fry beancurd strips in wok till golden brown. Remove from oil. Having stir fried the noodles for about 1 to 2 minutes, add fried beancurd strips and cut tomatoes. Continue to stir fry, add beansprouts and sauce (adjust amount of ketchup to taste). Add a little bit of water to keep noodles moist. After 1 to 2 minutes, add chinese mustard and stir for 1 minute (chinese mustard cooks fast and gets limp easily in yellow noodles). Is ‘chinese mustard’ the same as ‘kiam chye’? simcooks : This is your famous “choi sum” (in cantonese) or “chai sim” (in hokkien) veg. I see! I know ‘chai sim’! I should have guessed from your picture. Doh! It’ll be so weird to put ‘kiam chye’ into Mee Goreng LOL! simcooks : LOL! Yeah…the mee goreng would turn out rather funny. LOL!